September 12, 2016 May 15, 2018 ~ Steve N.
Meany’s is a tiny shack on the main drag in Siesta Key, one of several barrier islands in the Sarasota area. What makes Meaney’s unique is not that the donuts are tiny, but that they make them to order. There’s a little donut machine in the front window that cranks out the mini donuts, and it’s fun just to watch it do its thing. But, it’s a lot more fun to eat the end product. Ours were so hot we had to let them cool a few minutes before we could even handle them. 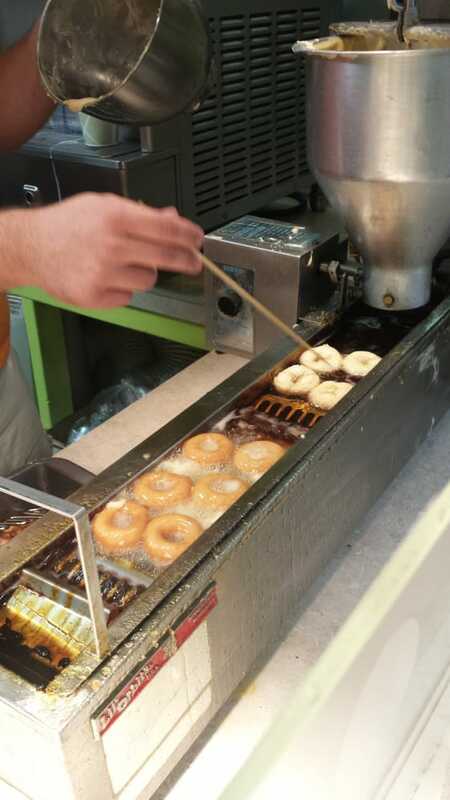 That’s awesome, because, in my mind, there’s only one way to eat donuts; you eat them moments out of the fryer. They’re delicious, and my favorite were the powdered sugar. They’re put into a small bag, and some of the sugar melts, but most does not. The mix of melted and unmelted sugar on the hot donuts is heavenly. Brasa and Pisco bill themselves as a Peruvian restaurant, and that along with the gorgeous pictures of the food on their website, and the glowing Yelp reviews had me salivating at the thought of dining there. While the food is heavily influenced by Peruvian cooking, the menu does have Asian influenced dishes as well. We started with the octopus ceviche. I love octopus and always order it when I see it on a menu. This dish was wonderful. 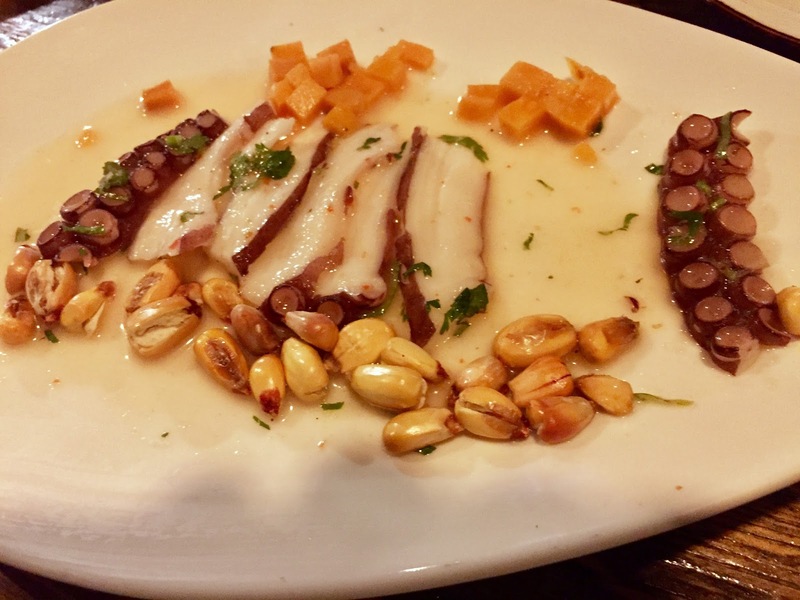 The octopus was in a pool of tasty citrus and was mild but flavorful. It was sliced at just the right thickness so that the meat was tender but still had an al dente chewiness. It’s served with fried corn. I’ve never had corn cooked this way before. It had an earthy flavor, with a wonderfully crunchy texture. We had eaten some before I remembered to take a photo. 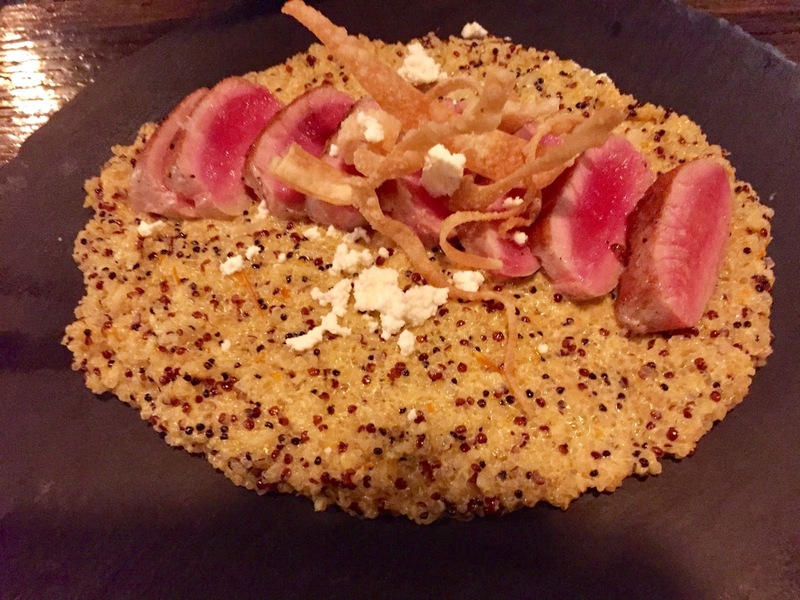 My wife ordered the quinoa risotto topped with tuna. Again, another dish that hit all the right notes. There were lots of textural and flavor contrasts. Everything was full of flavor, but no one flavor dominated, the dish was well balanced. This was the best preparation of quinoa I’ve ever had. I was tempted to ask for the recipe; I’d love to make that quinoa at home. For my main entree, I ordered an Asian noodle dish with chicken. I loved it, and it put Chinese take-out to shame. This meal was without a doubt, the best meal I ate on our trip, yet, it was super simple and quite plain really. Let me explain. 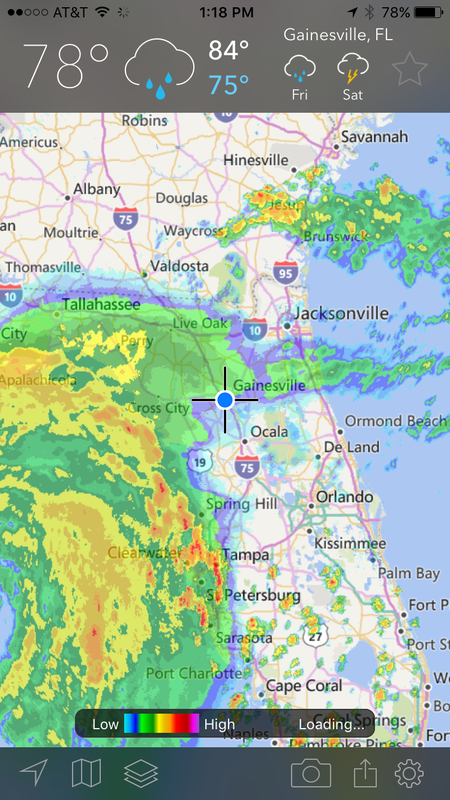 We planned to stop in Savannah Ga., on the way home. My wife was tired and insisted I find a hotel that had a good enough restaurant in it, so we wouldn’t have to leave the hotel to eat. That’s a tall order, but I got lucky and found 22 Square in an “Andaz” Hyatt in the center of town. It’s a beautiful hotel; it’s not value priced, but it’s not terribly expensive either. It’s very modern and is obviously geared toward a younger and hipper crowd, and one way they’re attracting that clientele is by putting better restaurants in the hotel. The menu at 22 Square had some creative dishes on it, but most were takes on classic American fare. There were only six appetizers and just four entrees. Both my wife and I ordered, “chicken under a brick with honey roasted carrots.” It doesn’t get any more American or simple than that. It was very simply prepared too. 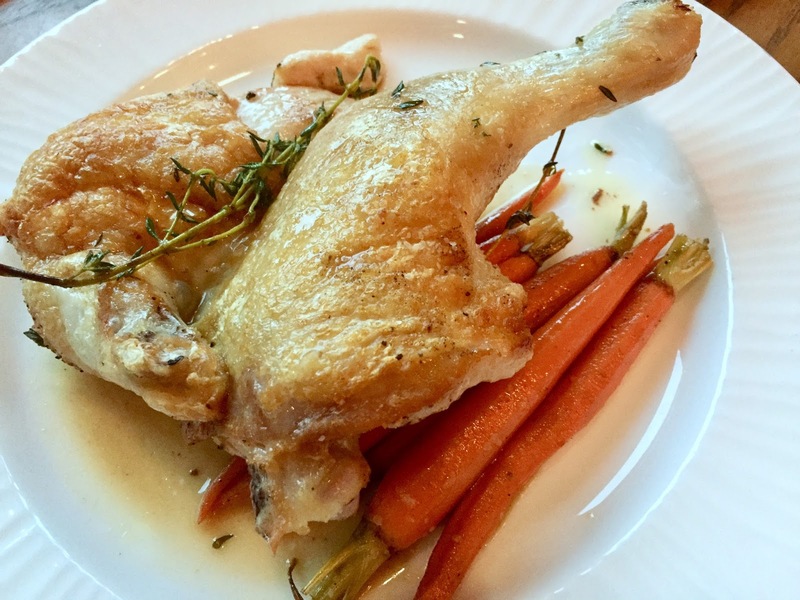 The chicken was roasted and seasoned only with salt and a sprinkling of fresh thyme. The carrots had just honey and salt. Our dish didn’t come with a starch, so we ordered a side of “smashed fingerling potatoes.” These too were super simple. They’re par-cooked, pressed flat, then briefly fried and generously salted with coarse salt. Any average home cook can duplicate this meal at home; you need no special equipment, ingredients, or skills to make the dish. So why was I so impressed with it? Everything arrived at the table piping hot. The skin on the chicken was delightfully crispy and perfectly salted. The chicken meat, tender and juicy. The carrots had just enough honey to add a little sweetness. They were still slightly crunchy, and again, perfectly salted. The potatoes were no exception. They too were cooked perfectly, tender with little crispy bits of skin here and there. The coarse salt worked magic with the potatoes elevating them to something special. They, the chicken, and the carrots were amazing despite their simple preparations. This meal affected me in a way that few meals have. It heightened my awareness of how critically important properly executing a dish is. At the same time, it made me sad. It’s sad because so few meals that I eat at restaurants—even good ones—strike such a perfect level of execution. Maybe the food at 22 Square isn’t always this good, in fact, I doubt it is. Maybe we got lucky. But it’s my hope that whoever is in that kitchen during dinner service gets it, they get how important execution is, and hopefully, our dishes are the rule and not the exception. Good hotels often have “real” chefs in the kitchen, but we often overlook what the hotels have to offer. Sometimes they are crazy expensive, and other times so mainstream that there's little appeal.